HONORS: Psi Chi International Honors Society, Psi Chi National Honors Society, Beta Kappa Chi Honors Society, National Society of Collegiate Scholars, Golden Key International Honors Society, Alpha Lambda Delta National Honors Society, Dean’s List Spring 2015-Spring 2017, and Psychology Departmental Honors candidate. During this semester, my research activities have included cleaning and organizing data in SPSS, Excel, and WJ programs. I have worked to correct errors in the data to prepare the data for merging and for analysis. I have also worked to rescore previously collected data to ensure that the data is scored consistently across the dataset. 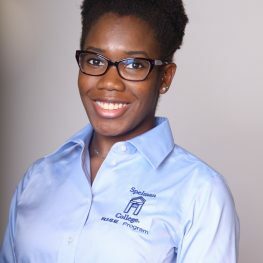 I began working as a research assistant in the Cognition and Temperament Lab at Spelman College under Dr. Nayena Blankson, on the School Readiness Study. Over my years in the lab I have had duties throughout the various stages of the project. I have aided in recruitment calling, emailing school directors, scheduling participants, and putting together recruitment materials to be handed out to prospective participants. I have administered the ninety-minute participant visits with the prekindergarten and kindergarten children. During the visits, I administer the Woodcock- Johnson tests, as well as the Ravens computer tasks; these two components are used to assess the children’s cognition and achievement abilities. I also helped enter W scores, and store data in Excel and SPSS. Additionally, in November of my sophomore year (2015) I went through the process of becoming a certified CLASS (Classroom Assessment Scoring System) Observer for kindergarten to third grade students. CLASS has been developed to look at a classroom emotional support, classroom organization, and the instructional support within a classroom. Utilized this tool to assess student/teacher interaction, the classroom environment, and the classroom quality for Dr. Blankson’s research study. I have also conducted research outside of my undergraduate community. In the summer of 2016 I participated in Yale’s Summer Undergraduate Research Fellowship (SURF) program, through Leadership Alliance. At Yale, I worked under Dr. Yarrow Dunham in his Social Cognitive Development Lab (SCD Lab). The SCD Lab’s focus is gaining a better understanding of how 3 to-6-year old children understand their social worlds and interact with others. While at Yale, I visited the New Haven Peabody Museum several times to help with data collection. At the Peabody, I helped obtain consent from parents, while also coding score sheets, and entering data. Learning how to juggle these tasks in a busy museum environment has prepared me to think on my feet, multitask, and remain focused and professional while conducting research in an active environment. page paper focusing on social group affiliation, and more specifically how children in the third party identify group affiliation and choose to associate socially with their peers. Throughout the process of developing my project I learned how to test my research question by coming up with carefully thought out methodologies and variables. I also had the opportunity to present my project to an audience at Yale’s Research Symposium, as well as the Leadership Alliance National Symposium (LANS). During my junior year (2016) I continued my research journey in the CAT Lab with two independent secondary data analysis projects, one through my acceptance into Spelman’s RISE program, and the other with Spelman’s Psychology Departmental Honors Program. My RISE project is designed to gain a more concrete understanding of whether classroom quality, specifically Instructional Support, is associated with fluid reasoning and crystallized knowledge tasks. For my honors thesis, I am investigating how classroom quality, specifically, Classroom Organization, influences executive function ability in African-American kindergarten children. Taking part in these experiences has provided me with the opportunity to present my research locally at Spelman’s Annual Research Day, and during the Annual Atlanta University Center Psychology Research Day, as well as at the Southeastern Psychological Association (SEPA) conference during the CEPO poster session. I will also be presenting my research in November at ABRCMS. I am interested in human development research as it relates to education, specifically as it pertains to underrepresented individuals (e.g., economically disadvantaged, individuals with disabilities, individuals of color) across the developmental lifespan. I am interested in obtaining my PhD in Education Psychology to conduct research that will help provide underrepresented people with a higher quality of education and academic assistance within their school environment and beyond.